This black bear hangs out in a tree above an Incline Village neighborhood. Each year, as summer winds down and people begin to trade their hiking shoes for skis, much of Lake Tahoe's wildlife population prepares for hibernation. But just because it's cold outside doesn't mean all of the animals are snoozing the winter away. Despite the misconception by some that all black bears hibernate in the winter, bruins in and around Lake Tahoe can occasionally be seen during the cold season, so it's important to know how to behave during a chance encounter. "We've had a certain number of bears active during the winter in the last few years," said California Fish and Wildlife Biologist Jason Holley. "If I had to guess I'd say 10 to 15 percent are active during the winter." For black bears throughout California, it's not at all uncommon to have some level of activity in the winter. 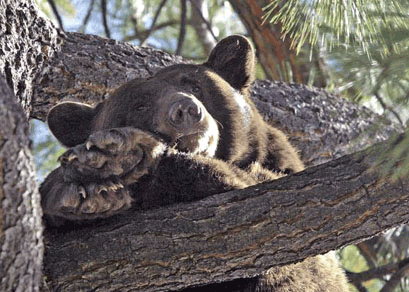 "We have bears near (Los Angeles) that never really hibernate, they're just eating," Holley said. "That's because hibernation is mainly adaptive to the lack of natural food availability." Black bears are omnivores and are sometimes called "opportunistic eaters" for their scavenger-like tendencies. Their natural diet consists of fish, berries, nuts, insects and sometimes a small animal. Since winters in the Sierra are colder and wetter than those in Southern California, there's less natural food available, so bears, like many other animals, tend to sleep the winter months away. "On the mountainside and down on the floor (of the Lake Tahoe Basin) are two very different behaviors," he said. "That doesn't make a bear want to stay in its den and get soaked," he said. It's typical for bears to wake up, look around and then go back to bed during hibernation, but issues can arise when they stay awake and supplement the lack of natural food sources during the winter with human garbage. "In Tahoe there's a lack of natural food available during the winter, but there are so many people around," Holley said. "If you're successful in providing significant food to an animal, they'll continue trying to seek that out," Holley said. "We call that being food habituated … they start to lose some of their fears of people and that can end really bad for the bear." It's against the law to feed wildlife, including bears, deer, squirrels or any other wild animal, in both California and Nevada. Fines can be as high as $500 in Nevada, and up to $1,000 with the possibility of jail time in California. Whether a bear gets food from a human who's feeding it intentionally or accidentally — like not putting trash into wildlife-safe containers or leaving food somewhere animals can get to it (even in a car) — it's harmful because it teaches them that they don't have to get food from natural sources. In turn, they become less afraid of humans — and more likely to cause problems. "All those factors make the bear less wild and increase the likelihood that agencies like ours and (the Nevada Department of Wildlife) will have to take (i.e. kill or euthanize) a bear whose behavior has been changed through no fault of its own," Holley said. Typically, bears are hazed with non-lethal means like loud noises and rubber bullets to scare them away from people and more populated areas. But when bears become food-habituated, meaning they've adapted and come to rely on human food sources, hazing loses its effectiveness. "A bear sighting is not a potential public safety threat," he said. "Just because you see a bear doesn't mean it's a threatening situation; most likely it'll wander off." If a sighting becomes an encounter, meaning the bear comes within 50 feet of a person, Holley said it's important not to panic and to instead back slowly away while making sure the bear always has an escape route. "Sometimes these food-conditioned bears get into a house; make sure you don't block the exit route … Go out the back door and try to leave a different way and don't block the bear's exit," Holley said. Bears don't just enter homes looking for food, either. "One of the things that's happening as we get well into November is they're looking for den sites," said Ann Bryant, executive director of the nonprofit BEAR League. "Quite often, more and more, those den sites are under people's cabins, homes or condos." When bears find their shelter under people's homes, it can lead to damage or even the bear finding a trap door and making its way inside the home. "There's never a week that goes by that we don't get calls," she added. "My guesstimate is that each winter in the Tahoe basin, there are about 100 bears, easily, that are going to be sleeping under people's structures, whether they're there or not," she said. The reason isn't entirely known, but Bryant said she thinks bears are often driven under homes when they're running from people. Crawl spaces also offer quiet, dry shelter that's usually near Lake Tahoe, which is an important water source for bears once they wake up in the spring. Homeowners and visitors commonly report bears under their homes during Christmas. Bryant said this is likely because many of those homes are vacant until Christmastime, so people don't notice there's an animal underneath until then. "There's been days during Christmas week when I have moved out six different bears in one day — that's how prevalent this is," she said. When black bears go into hibernation is based on the availability of food. Near Lake Tahoe, that generally means they'll begin increasing their calorie intake and searching for winter dens to stay in around late November, though sometimes it can take longer. Bryant said that if bear is discovered sleeping underneath a home, it can be scared away, and if it's still early in the season, it may just go back to sleep someplace else. At that point, she said it's best to invest in an electric fence to prevent the bear from returning. "We can't run them out when they're just about to give birth because they'll have no home, and if we run them out after she's given birth then the cubs will die," she said. Black bears typically give birth between January and February, and cubs tend to remain with their mother until they're about a year and a half old. In the spring, the mother and cubs will eventually move on from the den site. Bryant said that each year, she and her organization receive many calls from visitors hoping to catch a glimpse of a bear to get a picture of one to share with their friends. While it may be less likely to see a bear during the winter, it's not impossible. "We have a few that don't hibernate at all, but most of them do," she said. "Last year we had three sets of yearling cubs that stayed up all winter." Because it isn't unusual for there to be some level of bear activity year-round, Bryant said it's important to never leave trash or food out regardless of the season. "We used to think that come November you could put your birdfeeders out, but now that's too early," she said. "We had a call a few days ago. A bear got into a car for a gum wrapper." "Sometimes the car door closes and they go completely insane trying to get out … it happens all the time," she said. To keep bears out of vehicles, Bryant recommends removing all trash and scented products, including gum and lip balm. For extra bear repellent, she said that some residents keep a container with industrial strength ammonia on their seat while they're not using the vehicle to throw off any scent left behind. As for any up close encounters with bears, Bryant said that it's OK to appreciate the experience, but it's also imperative to scare the bear away — for their own good. "If you see a bear in your yard, whether you're a visitor or a homeowner, you need to let him know he can't be there," she said. "You can quickly snap a picture, but then give him hell. "Show tough love by yelling and stomping your feet. If you stand there talking sweet to him and taking pictures, then you've tamed him and created a monster."